In December 1990, 300 Lakota Sioux horseback riders rode 250 miles, in two weeks, through bitter, below-zero winter weather, to commemorate the lives lost at the Wounded Knee Massacre of 1890. This celebrated documentary relates the story of how the Lakota Nation mourned the loss of their loved ones for 100 years — seven generations of the Lakota. 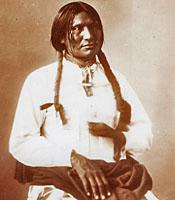 They also mourned the loss of some of their people’s sacred knowledge, which died with the elders at Wounded Knee. But in 1990, inspired by dreams and visions of unity and spiritual awakening, a group of Lakota decided to bring their people out of mourning through a traditional Lakota ceremony called “Washigila,” or “Wiping The Tears.” The Bigfoot Memorial Ride was that ceremony. The film interweaves stunningly beautiful contemporary scenes of the ride itself with archival film and photos and expert commentary to illustrate the history of the Lakota and provide an unforgettably poignant account of the events leading up to, including, and following the Wounded Knee Massacre. The DVD version of the film includes an extra 12 minutes of footage, shot in late 2004, in which participants in the 1990 Memorial Ride discuss the profound impact of the experience on their lives. “Wiping the Tears of Seven Generations” is a classic, thought-provoking work that explores the Lakota perspective on their history, culture, spirituality, and hope for tribal survival. The film will generate reflection, analysis, and discussion in a wide range of courses in Native American studies, American history and studies, cultural anthropology, and comparative religion. It was produced by Gary Rhine for Kifaru Productions and directed by Fidel Moreno (Yaqui/Huichol) and Gary Rhine; the eloquent narration is delivered by Hanna Left Hand Bull Fixico (Lakota).